^ 1.0 1.1 1.2 Skeat, W. W., ed. The Complete Works of Geoffrey Chaucer,Vol 1.. Oxford: Clarendon Press. 1899. ^ 2.0 2.1 2.2 杰弗雷·乔叟著，方重译. 坎特伯雷故事. 上海译文出版社. 1983年. ^ Morley (1890); Vol. V, pp. 247–48. 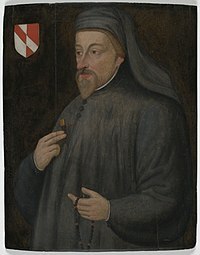 ^ Geoffrey Chaucer. poets.org. [2015-02-11]. ^ Marchette Gaylord Chute, Geoffrey Chaucer of England E. P. Dutton, 1946, p. 89. Ward, Adolphus W. Chaucer. Edinburgh: R. & R. Clark, Ltd. 1907. Hulbert, James Root. Chaucer's official life .... Collegiate Press, G. Banta Pub. Co. 1912: 75 [2011-07-12].